Basically this is the same as what I reported in this thread but with a better title and more specifics in an attempt to get someone's attention who can look into this. Using a packet sniffer I'm seeing all kinds of weird stuff when One Click Support tries to connect to that server. First off the server doesn't respond for 19 seconds after ACKing the client's initial "application data" packet. This results in the client issuing a RST. Second on the second try, when the client starts sends a bunch of application data to the server, the server ACKS it all and then sends one duplicate ACK. At this point it starts sending out ZeroWindow notifications which means that it can no longer except packets from the client. Shortly later it sends an "ENCRYPTED ALERT" packet and then a RST to disconnect. This process then repeats and the One Click Support client gives up. It does the every single time I try to use OSC. I have no idea why, but it would seem to indicate a server problem. 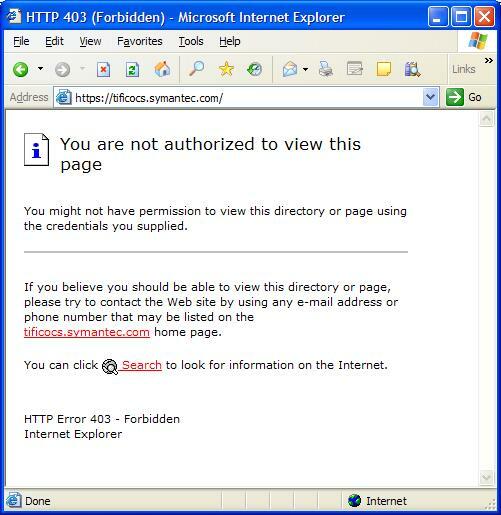 What's strange is that I can connect to https://tificocs.symantec.com/ using my web browser at work and receive a web page that contains the word "Forbidden", but when I try to do so from home the server immediately closes the connection without returning any data at all. I also tried a few SSL proxy servers and some return "Forbidden" and some simply show the connect being reset. I'm not sure why it works for some people at not others or why I can connect to the web site from work and through some proxies, but not at home or through others, unless it is related to MTU or RWIN or something. I have the packet dump of the entire connection attempt if someone at Symantec wants to get in touch with me. I also have dumps of me going to https://tificocs.symantec.com/ via a proxy server and directly. What OS are you running? I am assuming you don't have any trouble connecting to any other internet sites? Also are you behind a hardware router or firewall? Have you ever been able to run One Click Support successfully? As for going to the OCS site manually, it will return the "403 Forbidden" error, as it is not meant to be accessed from outside of using the OCS client. I'm running Windows XP SP3, but it's not OS related (see below). I am behind a router, but I've bypassed it for testing purposes and connected directly to my cable modem. I've also rebooted my modem. I have yet to run One Click Support successfully under NIS 2010. I have run it succesfully under NIS 2009 in the past, but the last time I did so was Aug 18, 2009 (it worked fine then). I only have NIS 2010 installed on my laptop, so to test things I use a web browser to see if the "403 Forbidden" error shows up when I go to the OCS site manaully in the browser. If it shows up I know that the server responded. If I see nothing or a "page could not be displayed" error I know something is wrong. It's not my router since I've bypassed the router and connected my laptop directly to my cable modem. It's not my laptop since I don't get a response from the OCS site manually on another PC I have (without NIS on it), nor do I get a response with my PS3's web browser. Using various proxies around the country gets me different results ("403 Forbidden" versus "page could not be displayed" error) when manually connecting the the OCS site. I don't know what the pattern is exactly, but I know I get "Forbidden" at my office, but a "page error" at home. Unfortunately One Click Support can't be run through a SSL proxy. The main difference here though is that in one case the server is returning an APPLICATION DATA SSL packet ("Forbidden") and in the other case it returns an ENCRYPTED ALERT SSL packet (no data). I haven't tried a public hot spot to see if that works. The server is returning some rather odd error packets, including DUP ACKs and ZeroWindow. The later in itself is indication of some kind of server problem. The problem appears to affect some people, but not others. I just want to clarify the connection to the OCS server isn't timing out, the server is simply closing the connection without sending a response. All signs on my end point to a server problem, which is why I'm confused that it works for some. I don't think it is geographically related though because my work connection goes through a gateway in Virginia and that works. I have exactly the same issue. My ISP is ATT in Northern California. No other (known) NIS 2010 issues. Just wanted to give an update on this issue. We are are working on it. We might need to ask one or more of you for more information as we troubleshoot. Morac, I think you have a Private Message from the One Click Support team. I have three pc's that all have NIS 2010, and One Click fails on all three (it asks to release/renew the IP settings, then to repair the host file, then to release/renew the IP, etc on all three.) I have no other NIS 2010 issues that I am aware of, so I don't need One Click support right now. But, I want to get One Click functional so that it is ready if and when I do have an issue and need assistance. (All three PC's go through the same router, two wirelessly and the other wired.) My service provider is ATT DSL in Northern California. Yes I received a pm, thank you. I responded with the data he requested. Oh and for anyone who is wondering what I mean by "Forbidden" or "cannot display", here's two screen shots, one from work (left), one from home (right). Yes they are using different version of IE (6 vs 8), but I can only work with what I'm given. As far as I'm aware, IE 8 is capable of displaying HTTP 403 errors. 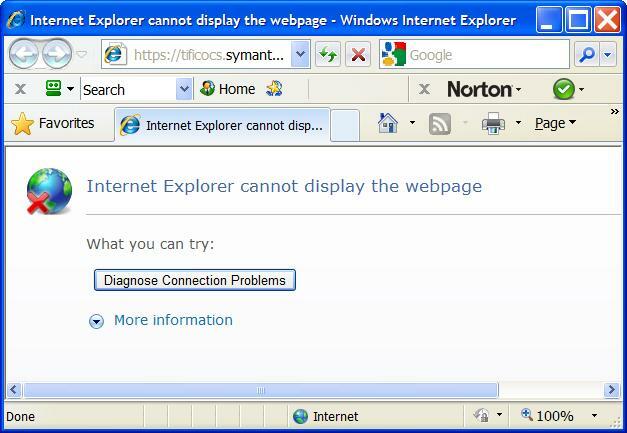 Also the "cannot display the webpage" is a generic error that IE 8 puts up if it can't display the web page. It ranges from typing in an invalid address to the web server simply not responding. Other browsers are more specific with their errors. For example Google Chrome gives this error "Error 324 (net::ERR_EMPTY_RESPONSE): Unknown error." They contain a number of "Errors". Would this relate to the Fix Now / One Click pop up I am getting now at intervals that it says it can't fix, that it's a 3039,1 error (and nothing comes if you search) and it's only offer is to help me wipe Norton off the PC with NRT and reinstall which I've declined. Let me know if relates to what you are working on or interested in. It would only relate if One Click actually fails to run. The basic issue here is that One Click Support isn't working for some people, but everything else works fine. If you can run One Click Support manually and it downloads and runs, then your problem isn't related. It sounds like One Click is actually working on your machine since it's giving you a suggestion. My One Click problem was gone this morning. Good work Norton staff. It's working for me today as well. Thanks OscarL and the behind the scene guys. Thank you Morac for the information and your assistance. This helped us identified a issue with a network port that prevented some users access to our server. This issue has now been corrected, and appreciate everyones understanding and assistance.